The battery is equipped with the industry standard power tap connector. A typical 25-watt camcorder will be powered with Beillen BL-BP160 for more than 6 hours! COMPATIBILITY Beillen V-Mount type Li-ion batteries are compatible with professional camcorders equipped with V-Lock mount battery adapters (e.g. Betacam SX, Digital Betacam, DVCAM, XDCAM). Compatible with anything that uses V-Mount (including lights). Compatible with Sony Camcorder: DSR-250/300/370K2/570WSL/600P EX250/330/350 S270 PMW-EX330K/330L 580K/580L F5 F55 F23 F35 F3K F3L TD300 680/700/850 HDW-F900R 800P 680 PDW-700/850 DVM-7/70/707P/709WSP/790WSP/90/90WS BVP-5/50/550W/7/70/90-BVV5 BVW-200/300/400/400A/505/507/550/570/590/D600 and More V mounted devices Compatible with Sony BP batteries: BP-L60A BP-IL75 BP-L40A BP-800S BP-130L BP-GL95 BP-GL65 BP-L60S BP-140A BP-L90A BP-FL75 BP-L80S and other V mount batteries. 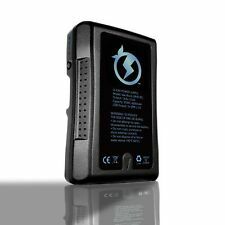 Used IDX v-mount battery, 91Wh. Has two ptap ports and a usb port. Battery is fully functional but has reduced capacity compared to a new battery. IDX EB-424L Quad V-Mount Battery Power Base Station - 12V or 24V up to 696W! Capacity: 10400mAh. 1 x 10400mAh Li-on Battery. Its high capacity enables the user or photographer to record the program or project totally and no need to worry about the unwanted break off. V-Mount battery for professional Sony camcorders PMW-EX330K PMW-EX330L, PMW-580K PMW580L, PDW-680 PDW-700 PDW-850, PMW-TD300, HDW-F900R HDW-680 HDW-800P, PMW-F55 PMW-F5. Blueshape 100HD v-mount battery. Fully functional, but screws that hold case together stripped out, so held together with gaff tape as shown in pictures. Obviously capacity will be leas than a new battery. 95Wh (6.6Ah) 6600mAh V Mount Lithium-Ion Battery. Super huge capacity V-Mount battery 177Wh 12000mAh/14.8V. 1 V mount Battery. lightweight V-Mount battery. Lightly used Dynacore Batteries. Shows normal signs of wear and tear. 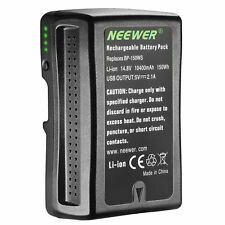 The PowerLink feature connects two E-HL9 batteries for a total power capacity of 174Wh. The E-HL9 supports Digi-View for reading battery levels in many of today’s camera viewfinders. Battery Management System (BMS) can also be used for enhanced diagnostics and a comprehensive review of the battery’s history of use. Great heat dissipation performance for stable and safe operation. Adapter Output: DC 15V. Charging Output: DC 16.8V. Input: AC 90V-240V (EU Plug). Fit: V-Mount Battery. The V-mount battery is not included. These batteries have only been used a handful of times and since I have so many, some have only been used a couple of times. Interface: SONY V Mount. Adapter Output: 12V 50W. While the form-factor may be small, the Nano-series batteries can support up to 8-amp draws at 14.8V. In classic Core SWX fashion, the exterior of the battery has a rubberized feel for a sure grip. Demo used, like new Anton Bauer Digital 90 V-Mount Battery (14.4V, 93 Wh). The side panel gets in the way otherwise as the batteries are too wide. All of them work great except Battery #3. It works fine to power the red till about 45%. It's been like that since new - just didn't use them past 50% right when I got them so I never knew. New, never used Functional Condition. New - full manufacturer warranty, we are Rolux U.S. Authorized Dealers. The Rolux RL-C95S is a lithium-ion chemistry battery for professional camcorders and VTRs that accept V-mount batteries. This battery has a power capacity of 95WH (watt hours). Genuine Sony V-Mount style batteries. No stickiness. Gently used in great condition, comes with battery, charger and cord. DUO150 is a high-performance Li-Ion V-Mount battery with a 146Wh capacity and ability to handle 10A/120W loads. 146Wh capacity. Battery Capacity 14.8V, 9.8Ah, 146Wh . Manufactured in co-operation with Sanyo (the world’s premier supplier of Lithium Ion cells). Perfect for RED, ARRI, Blackmagic URSA, Nauticam, Steadicam. 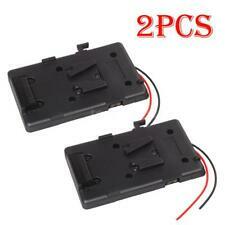 - Genuine Japanese Li-Ion Battery Cells. Battery Type V-Mount. Financing allows you to conserve working capital while also providing a fixed and forecasted technology spend. New - full manufacturer warranty, we are Rolux U.S. Authorized Dealers. The Compact-Series 98Wh V-Mount Li-Ion Battery from Rolux outputs 14.8V, has a capacity of 6.6Ah, and supports up to a 12A draw. Product Weight: 1.35 kg. Capacity: 220 Watt-Hours. Encased in a compact, brick-like enclosure, Anton Bauer's Cine 90 VM Battery is designed to fit on run-and-gun and built-up cinema rigs. Inside the battery, individual cell activity monitoring prevents cell failure from over-current and excessive temperatures. One battery lasts about 7 hours of non stop video shooting in RAW mode on a BMPCC. There is no better deal available anywhere than this. Rapid charging from 20% to 100% in about 2-3 hours. Mount type: V Mount. Max Output: 150W, 12A. Product Weight: 0.80 kg. Compatible: Fits on all V-Lock compatible products and Fovitec 600/900/1200 series LED panel lights. Battery Life: up to 7 hours @ full power on Fovitec Premium. Compatible with all Fovitec V-Lock LED Panels including. 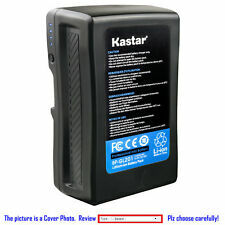 There is an endless variety of V-mount batteries to choose from on eBay. Here are a few of the top criteria to consider when choosing a V-mount battery. Which factors are most critical in V-mount battery selection? Most considerations for your purchase of a new or used V-mount battery are dependent on specific end-use as detailed below. Capacity: Video equipment consumes a lot of power and shooting locations are often remote. It is crucial to have enough battery power to keep your equipment functional from start to finish. Size & Weight: You will be carrying not just your camera but also the batteries to keep it running. With so many video shoots in remote locations, it is vital to have a battery that squeezes the a large capacity into a small, light package. D-tap outlets: One of the benefits of V-mount batteries is the ability to charge multiple pieces of equipment using just one power source. D-tap outlets facilitate this action. How many there are and where they are located is a vital consideration. Stackability: Stackability is the ability to attach multiple batteries to your camera and switch them out individually. Stackability lets you swap empty batteries for full ones without losing power completely. Are V-mount batteries compatible with all cameras? A "dummy" battery replaces your camera's original battery and connects via attached cord to the corresponding 12V port of the V-plate. V-mounts were designed for professionals and must be attached to 15-millimeter camera rigging. Many sellers on eBay offer bundled packages combining everything you need in one purchase. What items can you charge with a V-mount battery? Nearly any device can be charged through D-tap outlets standard on most V-mount batteries or V-plates. With many configurations available, you can choose the exact combination of battery and V-plate functionality to charge nearly any device. As needs change, your charging configuration is adapted by replacing the V-plate with a new one with the desired functionality. The standard 14.8V output of V-mount batteries will safely charge most devices. With an array of V-mount batteries on eBay, it is easy to customize your power supply and ensure you never miss the shot. What is a V-mount battery? V-mount describes the mechanism used to attach an after-market battery to existing camera rigging. The V-mount creates a secure lock that can withstand rough handling. V-mount is the industry standard worldwide, you can find a variety of batteries and accessories featuring V-mount locks on eBay.